With offices in Greenbelt, Maryland, the trusted attorneys of Joseph Greenwald & Laake, PA, have a proven track record for handling the most complex and complicated of legal issues. The attorneys at this law firm are ones who act as strong advocates for their clients and are prepared to challenge the law, pushing for change if need be. For more than 40 years, the lawyers at Joseph Greenwald & Laake, PA, have been serving individuals and businesses throughout Maryland. From transactional work to litigation, this is a respected law firm known for taking on all types of cases, including those related to business law, employment law and civil rights. The law firm has also found successful outcomes and solutions for clients involved in criminal defense, family law, estate law and personal injury cases. 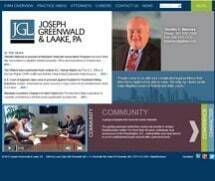 Joseph Greenwald & Laake, PA, is a well-respected and well-established law firm in Maryland. The legal team prides itself on its tireless dedication to getting positive results for their clients. The law firm has a reputation for being professional and personal. Whether it is working one-on-one with an individual, or talking strategy with multiple business partners, these lawyers listen to their clients concerns and work toward finding the best possible solutions.